As far as I’m concerned my own credibility as a palaeontologist is slightly tarnished by not having been on a major dig. I have done some basic prospecting in Germany, and went out, found and cast some footprints in Peru, but it’s not quite the same. 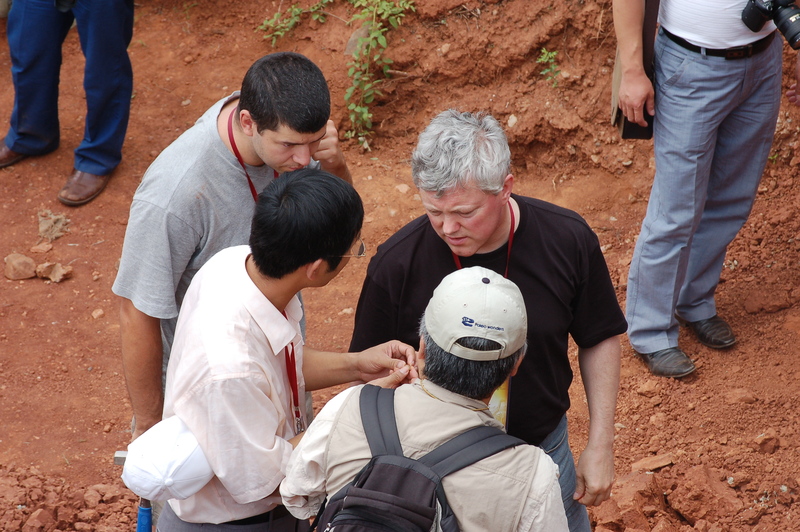 (Pictured is Dave Unwin, Jungchang Lu and myself looking at eggshell pieces in Henan). Hone, Unwin & Lu take in the sights in a hole in the ground. However all that is about to change…. Yep, and this time it’s not an archosauromorph (close enough) or reptile (pushing it) but, *gasp* a mammal. But really quite a special one, and since I have photos of it, and as far as I can tell, no-one else does, I thought it worth posting. I had intended to put this picture up as part of the pterosaur head crests post last week, but I could not find a decent place to slip it in, so it went unpublished. I’m rather pleased with it though so it seemed a shame to waste. It’s for an as yet unpublished (well, unsubmitted actually) paper I am working on, but hell, it’s a bunch of pterosaur crania so it should be of interest. This is just a quick survey of *what* soft tissues are known or can be directly inferred in pterosaurs based on a variety of specimens. I won’t be going into the details of which specimens preserve which bits, how, where you can see them, what they mean or how they function – that would take pages and pages. This is meant just as a quick overview to show what can be gleaned from the fossils and it is far more than you might think (pterosaur courtesy of Dino Frey). While of course we can infer that as vertebrates pterosaurs had eyes, hearts, lungs, livers, kidneys, skin, and muscles these are rarely if ever recorded in the fossil record at all, and of course the fragmentary nature of the pterosaur fossil record (compared to say, dinosaurs) means that these events should be far rarer. However the ‘damage’ is offset by the fact that a great many pterosaurs come from lagerstaaten deposits of exceptional quality, and thus a great many features are preserved on occasion. Coming very soon (tomorrow morning in fact) is an important new paper on dinosaur diversity. OK, it’s important to me, and thus you are going to have to read about it. The paper will be published in Proceedings of the Royal Society (B) and thus there is actually a press etc. embargo on anything associated with it until midnight tonight (GMT) hence this little post until the real one comes out tomorrow. Oh and as a ‘treat’ feel free to sign up to my Facebook Feed here. As part of my ‘science basics’ project on here (assuming it gets further than just a few posts) I thought it worthwhile trying to dial back some of my natural tendency to pitch this blog at a technical level, and try and make it a bit more accessible in general. In other words rather than just banging on about anurognathids, pterosaurs cranial crests and origins, it might be more appropriate to give a very brief overview of pterosaurs in general for anyone not that intimately familiar with them. I do have a bigger project on this very area slowly coming to the boil, but it never hurts to have more information out there, and it gives me an opportunity to do my own summary. With my choice of blog header (thanks again Luis!) 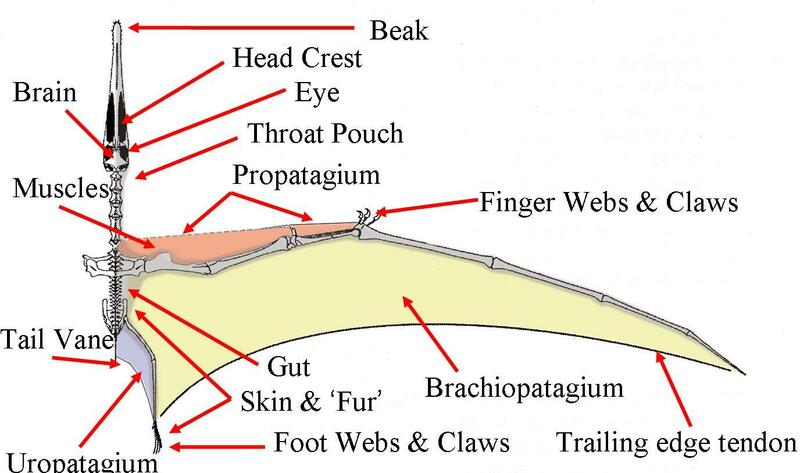 I thought it about time I covered (albeit superficially) the fascinating world of pterosaur head crests. For all the (justified) interest that dinosaurs like Parasaurolophus and Styracosaurus provoke, really they can’t even begin to touch some of the more extreme pterosaurs in terms of diversity and, when you consider these things actually fly, size. One of my quick posts since there is not too much to say, but it is an interesting photo and one that will be of interest to the SV-POW! boys. 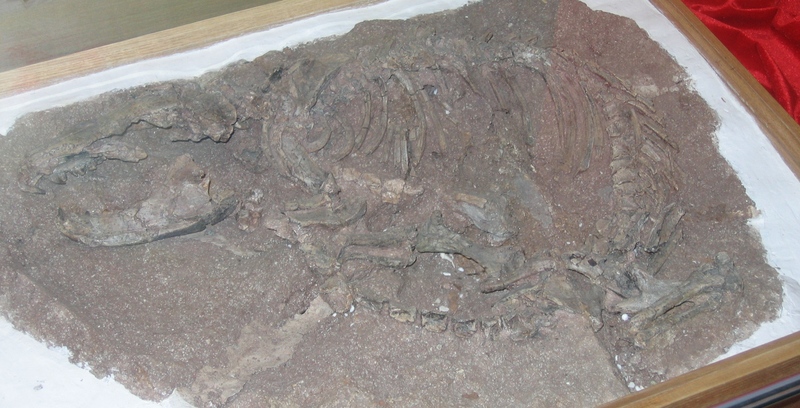 It shows the anterior part of the tail of Mamenchisaurs on display at the Chengdu University of Technology (CDUT) in China. As you can see, one of the neural spines on the left of the picture has a large and prominent growth of bone protruding from it. Now stupidly I did not take any real notes about it, but it is not a result of distortion or just some matrix left hanging on the neural spine, but fossil bone. I can only assume that it is either the result of a badly healed break (though if so, it must have been close to the tip of the original spine and it is odd that it has healed so badly and created such a large mass as a result), but I think it more likely that this is a result of an infection that spread inside the tail causing the build-up of ossified tissue. 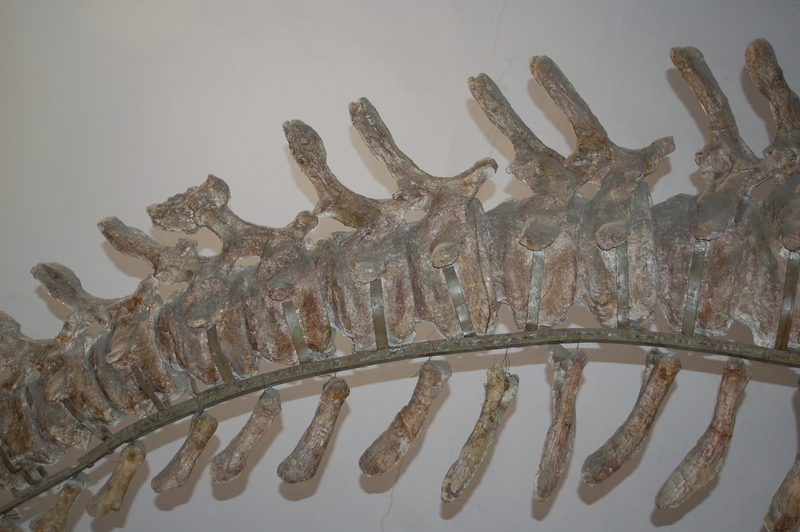 Clearly it was not too bad as it never spread down the neural spine nor reached the other vertebrae. An interesting little snippet though I hope. There seems to have been a few posts recently on various blogs talking about science communication through blogging and it has made me think about my own efforts. Broadly speaking my posts fit into two categories, either talking about research and archosaurs in a fairly technical manner, or talking about science communication (doing it, and how it should be done) in a very general manner. In hindsight, this is an odd dichotomy – not that I am talking about two rather different topics, but that by definition when I am writing about archosaurs (doing science communication) I am actively making a decision to do it at a technical level inaccessible to most people. This does not make me a hypocrite – it’s my choice and I know people will still read it and understand it, there ae other blogs, websites and books that deal at a more mainstream level and right now I am choosing to avoid that. Still, it is odd, given the time and attention I give to the actual pattern and process of science communication itself. There is one more thing about ‘Nature’ style descriptions that I want to address here that that affects more than just the highest ranked journals, (though they are the hardest hit / most culpable depending on your interpretation), and that is the pressure for descriptions of new taxa to be accompanied by cladistic analyses. Now let us get on thing clear right off, I love cladistics and I consider myself a cladist. As a tool for biological (and beyond as it happens) research, it is an extremely useful and powerful one and its correct use can add enormously to a description (by placing the organism in it’s correct phylogenetic context) and is generally useful for all kinds of evolutionary things. However, it is a complex and difficult method to get to grips with. On the face of it, it is simple, assemble anatomical character descriptions, code them, run the program, print the tree. But that simple description masks a huge number of subtleties, complexities and details that take a long time to master and many simple mistakes can wreck an otherwise good analysis and render the results incorrect and effectively meaningless (by the way if you are horribly lost at this point, cladistics is the method used to create those evolutionary trees you see everywhere that show how taxa are related to one another). I consider myself a competent cladist only – I took more than one course as an undergraduate and masters student on the topic, cladistics formed a large part of my PhD research, and I have published several papers that include cladistic analyses, I have experimented with methods a little and taught the odd lecture on the subject. I would be happy to provide a phylogenetic analysis with a new taxon I was describing provided I was familiar with the anatomy of the clade in question and recent phylogenies based on (I did this for Fodonyx), but I am in the minority. Cladistics, despite its apparent simplicity is a tricky bugger and is rarely taught beyond the most basic principles (there are not many cladists out there), yet poorly conceived and poorly executed phylogenies are regularly and needlessly tacked onto descriptions, and this seems to be more common with the higher ranking journals who seem to pressure unwilling authors into including them. This post has been sitting around for a while waiting for the right moment, and today seems to be it. Matt Wedel has just put up a large post on the problems of impact factors and as that is touched on here (albeit from another angle) it seemed prudent to use the opportunity to weigh in on the subject. If there is one outstanding issue in palaeontology right now it is what I call the ‘Nature’ problem of descriptions. Exciting and above all important specimens get into journals like Nature because they deserve to get a wide audience, but even with the current trend for extensive online appendices, the descriptions of the specimens are often reduced to a few lines of apomorphies as space is made for colour photos and discussion of the evolution and lifestyle of the new taxon (in what is already a tiny paper). Now this is all very well in principle – I would be delighted to get into Nature and if I ever got material exciting enough to warrant submission there, I would do so. But, and this is a big but, these kinds of papers are completely insufficient for basic research.